The amount of fresh air entering the barn is called volume. Fresh air is introduced into a barn to remove and dilute accumulated heat, humidity, airborne pathogens and noxious gases. As the level of these air contaminants increase, so does the need for a greater volume of fresh air to achieve proper air quality. The rapidity at which this volume of fresh air is introduced into the barn determines the air exchange rate. The length of time it takes for the complete volume of air contained in the barn to turn over once is called one air exchange. The recommended frequency of air exchanges will vary based upon the season. 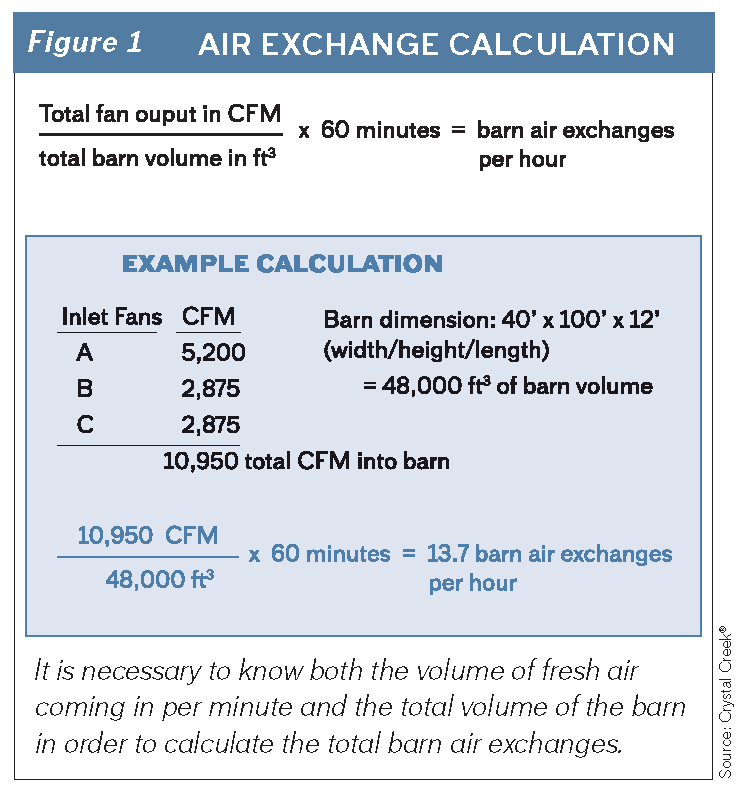 In mechanically ventilated calf barns, the volume brought into the barn can be calculated by the fan output. Fan output is measured at a rate of cubic feet per minute. Adding the cubic feet per minute of every fan that draws fresh air into the barn will yield the total volume of fresh air coming into the barn per minute. 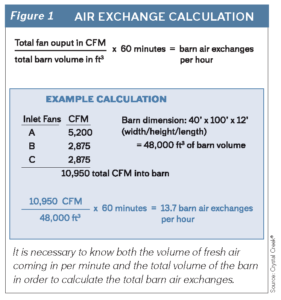 It is necessary to know both the volume of fresh air coming in per minute and the total volume of the barn in order to calculate the total barn air exchanges (Figure 1). Fans that are not directly tied to a source of fresh air, such as panel or basket fans, are considered recirculation fans. These fans are great at increasing air speeds and can help with heat abatement in the summer, but should not be counted when calculating the fresh air volume coming into the barn. According to the University of Wisconsin School of Veterinary Medicine, properly ventilated calf barns should be experiencing four air exchanges in the winter, 10 to 20 air exchanges in the spring and fall, and 40 air exchanges in the summer. 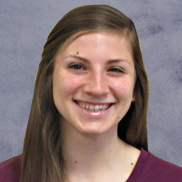 The University of Wisconsin School of Veterinary Medicine also has volume recommendations based on calf stocking density. In the winter, they recommend 15 to 30 cubic feet per minute (cfm) of fresh air per calf. Unfortunately, in barns utilizing natural ventilation, there is no way to precisely quantify the volume of air brought into the barn due to inconsistent weather patterns and wind speeds. Air speed is the measure of how fast the air is reaching the calves. Similar to air volume requirements, air speed recommendations change according to the season. It is important to evaluate how air speeds change throughout the year, as rapid air that is necessary for heat abatement in the summer can cause a harmful draft in the winter. During cold weather, calves should not experience air speeds greater than 60 feet per minute. Summertime air speeds are less strictly guided, but experience shows that air speeds of 200 feet per minute or greater are necessary for heat abatement. The hottest days often have little breeze and can cause heat stress. Opening the curtains in a naturally ventilated curtain sidewall barn is a great way to allow airflow. However, because this system relies on natural breezes, which can be erratic, these systems cannot provide the consistent air speeds found with mechanical fans. Air distribution describes where the fresh air is delivered throughout the barn. The most important aspect of fresh air distribution is uniform delivery of fresh air throughout the barn at calf level. Many ventilation systems meet air volume and speed requirements but fail to deliver fresh air at the calf level due to obstructions in the barn. Air flow follows the path of least resistance, and an obstruction, such as a tall concrete knee wall or solid pen panel, can deflect air away from its intended target: your calves. There are several techniques that can help direct air to the calf. Some ventilation systems operate with baffles in an effort to create obstructions above the calf, forcing the air to be redirected down to the calf level. Systems with positive pressure tubes can dictate the direction of fresh air by the location of the holes in the tube. 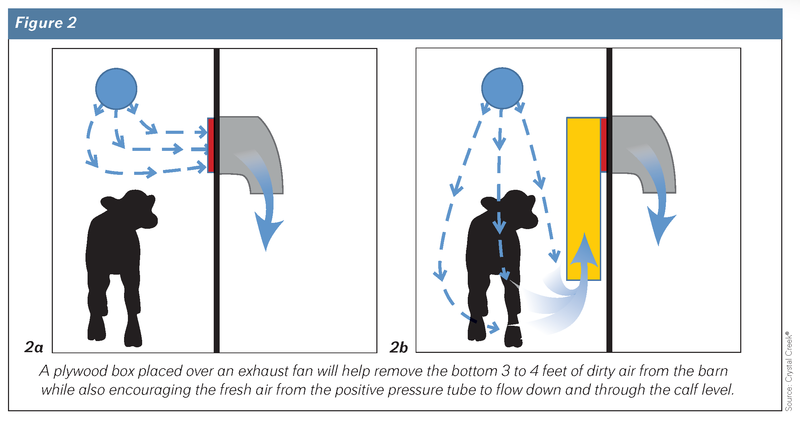 Some calf raisers extend a box off the exhaust fan that reaches to calf height, pulling air directly from the calf environment (Figure 2). A plywood box placed over an exhaust fan will remove the bottom 3 to 4 feet of dirty air from the barn while also encouraging the fresh air from the positive pressure tube to flow down and through the calf level. When attaching a box to a fan, provide two square feet of inlet area for every 1,000 cfm to avoid reducing the fan’s output. Winter is the most difficult season to tell if fresh air is being distributed at the calf level, as a properly installed ventilation system should not show any visible signs of air movement, such as moving straw. To better assess airflow in the barn during winter, producers can use a fogging test as a visual tool (Figure 3). Introducing fog next to the intake of an outside fan will demonstrate the path outside air takes once it enters the barn. 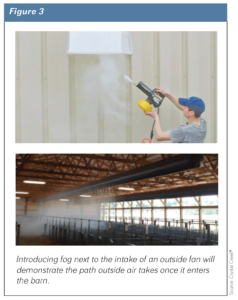 Producers can also introduce fog in the center of a barn to see where it exhausts and how quickly it disperses. The goal is to exhaust all fog within 15 minutes or less from the time it enters the barn. This test can also help identify areas of still air, known as dead spots. A well-designed ventilation system that employs proper air volume, speed and distribution will benefit calf health by improving air quality. It will do this through the removal of accumulated heat, humidity, airborne pathogens and noxious gases. Understanding the principles behind calf barn ventilation will allow producers to critically evaluate the ventilation options available and ultimately enable them to provide the best air quality for their calves.